The ElectroMotion ESL X Features a large XStat electrostatic Transducer. Twin 8-inch high-excursion woofers are housed in a non-resonant asymmetrical bass reflex (ported) chamber, in a surprisingly compact enclosure. Woofers have custom engineered High-Rigidity paper cones, with extended-throw driver assemblies. Component elements within the e-mail x replicate the design and performance of components used on many of MartinLogan more expensive loudspeakers, such as custom-wound transformers, air-core coils, large steel Laminate inductors, polyester and low DF electrolytic capacitors. Custom 5-way bi-wire binding posts allow for secure wire connections. System frequency response is 41-22,000 Hz 3dB. Recommended amplifier power is 20-400 watts per channel. Impedance is rated at 6 ohms (1.6 ohms at 20 kHz); the e-mail x is compatible with 4, 6, or 8 Ohm rated amplifiers. 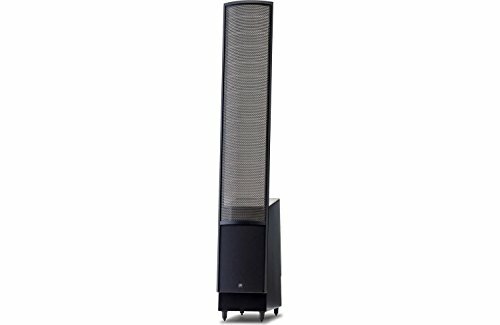 Class XStat Transducer one of MartinLogan original breakthroughs, class (Curvilinear line source) technology, has been an essential ingredient of every electrostatic loudspeaker we've produced. Proprietary manufacturing methods enable construction of electrostatic panels as cylindrical sections. Their gentle horizontal curvature solves the problem of obtaining good high-frequency dispersion from a large radiating surface without compromising overall sound quality or reliability. Another key attribute of the ElectroMotion ESL X is its naturally dipolar radiation pattern. The e-mail x radiates sound with equal intensity from the front and back of its diaphragm in opposite phase. As a result, sound waves rippling out toward the sides cancel. This minimizes side-wall reflections that tend to muddle sonic detail and stereo imaging. While the reduction in output to the sides contributes to the astonishing clarity for which electros tats are revered, the energy reflected off the wall behind the speaker opens up and deepens the sound.